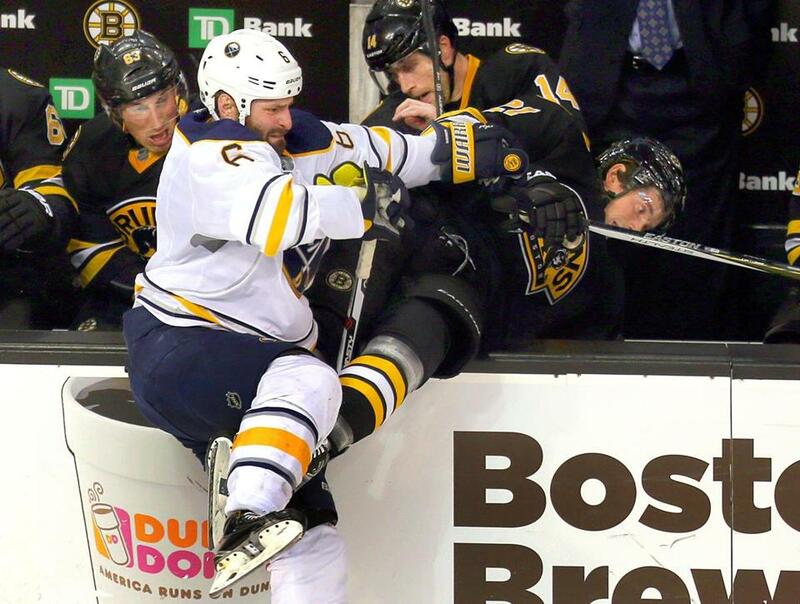 The Bruins’ Loui Eriksson got a seat on the bench thanks to a check by Buffalo’s Mike Weber in the first period. There was outrage in their words after it was over, after the Bruins had softened in the third period, allowing Buffalo to come back for a 6-3 win on Saturday night at TD Garden. It had been a collapse, pure and simple, and they deemed it unacceptable. It was the same throughout the dressing room. “It’s definitely unacceptable going into the third with a lead and then extending it and just — stop playing the way we want to play, stop playing hockey, just kind of very careless and tried being cute and we got the result that we, that we deserved I guess,” Patrice Bergeron said. The Bruins came in with a golden opportunity to pass Montreal for the Atlantic Division lead. And yet, after the Canadiens lost for the sixth straight time, the Bruins were right where they had started — but this time down a point to Detroit, which won in Nashville. The Bruins went up by two goals at 6:59 of the third period after David Krejci batted a puck past former Bruins backup Chad Johnson (30 saves). But the Sabres managed to score five unanswered goals in the third, starting with two in the span of just 39 seconds to tie the game with nine minutes to play. It started with a bad-angle goal by Ryan O’Reilly at 10:21, followed at 11:00 by Jack Eichel’s first goal of the night, which kicked off the skate of Kevan Miller and past Jonas Gustavsson (23 saves). At 14:24, Jamie McGinn scored the winner. The Sabres would then put the game away with two empty-net goals, one by Eichel (two goals, two assists) with 1:18 left and another by O’Reilly — assisted by Eichel — with 50 seconds remaining. The Bruins had had another chance to move into first place Tuesday. But they had excused that loss to the Blues, believing that they played well despite two breakdowns. So was there one missed goal that particularly bothered him? “I feel like three out of four goals were weird,” Gustavsson said. “You can’t really practice those — a lot of bounces and screens and I don’t know. Maybe I thought I saved the second one when it bounced behind the net there. I thought I managed to get a good seal there, but I guess I was a split-second too late. The game had been complicated for the Bruins at 12:04 of the first period when Torey Krug engaged in a race to a puck with Zemgus Girgensons and pulled up lame. Krug immediately turned toward the bench, signaled for a change, and left the ice. He did not return, and the Bruins had no update on his condition after the game. That meant that, after 5:03 on ice and five shifts from Krug, the Bruins were playing with five defensemen. But even being down a player, the Bruins had built a lead through the second period. After Buffalo opened the scoring with an Evander Kane goal at 5:13 of the second period, the Bruins came back with a vengeance, scoring twice in 1:16. Matt Beleskey got the first, deflecting a shot by Miller at 5:49 of the period. That was followed by a Bergeron score from Marchand at 7:05. When Krejci got what looked to be an insurance goal, the Bruins appeared to be within minutes of first place. Amalie Benjamin can be reached at abenjamin @globe.com. Follow her on Twitter @amaliebenjamin.